I do love a weekend in Norfolk and this weekend was no different. Our main target was the Isabelline Wheatear, but I wasn’t overly looking forward to it as I remembered the walk to the Spectacled Warbler in the same location and I wasn’t convinced my dodgy hips would make it. Luckily as we left the flat a report came through of another near Ely, which is on our route up and so we made a beeline for that. A short walk later and we were gazing at the lovely bird. Perfect! A detour to Welney was made to try and see some Bewick’s Swan but to no avail unfortunately. We’d left London pretty late so there was only time for one more thing before sunset and we decided on the Desert Wheatear. 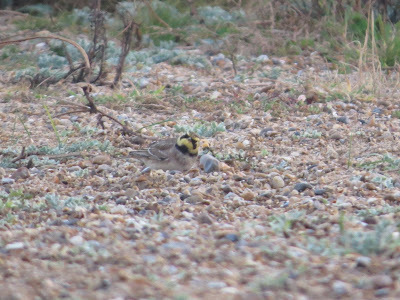 We parked at Salthouse beach and started trekking across the pebble beach which is when my hips decided they had had enough and I had to stop half way to the Wheatear. Boo! 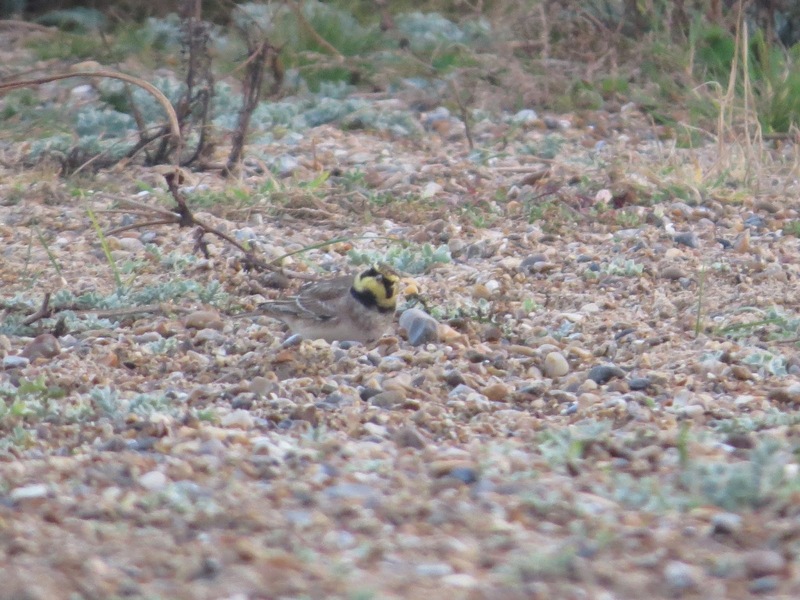 Amazingly though at this point Stuart spotted 2 low flying birds and got me onto my first ever Shorelark! I spent a very happy hour sat on the beach watching them and showing them to the birders who walked past whilst Stuart went to see the Desert Wheatear. Excellent evening. The next day we took our customary Sunday morning wander around Kelling Heath but there was nothing of note. A report of Waxwing in Brancaster from that morning lured us over there but after a while of driving and wandering around we hadn’t spotted anything that looked Waxwing like and so we decided to call it a day. As we were driving off, an odd looking Starling flock flew over. Braking abruptly we hopped out the car and found that the Waxwing flock were mixed in! We’d never seen Waxwing in flight before so it was really interesting to watch them before the eventually settled in a tree further down the road. To finish the weekend we had a brief wander around Titchwell. As usual we amassed a decent list but there was a bit of uncertainty at the end when we were with a crowd watching the bushes where the Dusky Warbler had apparently been 10 minutes earlier. Eventually a small bird was spotted low down and said to be it. I’ve never seen one before so I’m still unsure – everyone there agreed it was but then 20 minutes later as we were driving off it was reported as not present! The bird we were watching had pale legs, a dark line through the eye and was very pale underneath but I didn’t know at the time to check for the flick up at the end of the supercilium so I’m in two minds. One to ponder on I think. I hope so too, they were great to see! Had a search in Scotland this week for Waxwing but didn't catch up with any unfortunately. Hope you have a good time in Norfolk!